Georgia Tech-Savannah hosts fundamentals course to teach systems engineer-related professionals real world application. 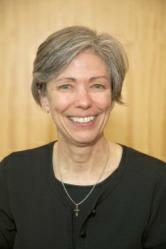 “Our instructors are practicing engineers and scientists who bring their systems engineering expertise to the students. We then challenge the students to apply these methods, techniques and tools to realistic problems as we mentor them along the way." 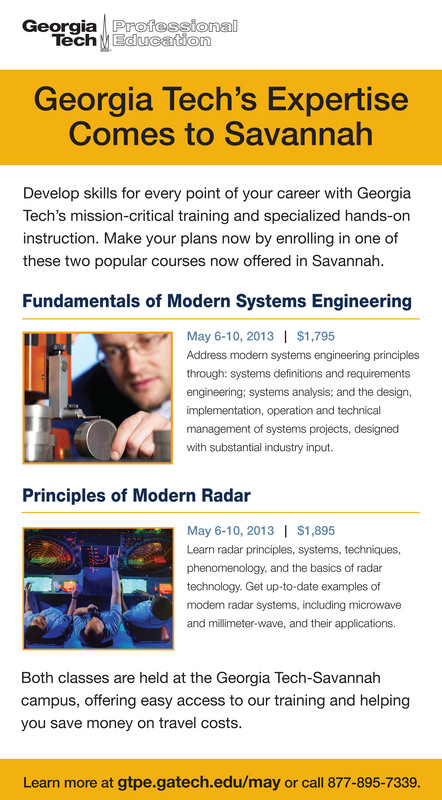 Georgia Tech Professional Education will provide a Fundamentals of Modern Systems Engineering course at the Georgia Tech-Savannah campus on May 6-10, 2013. The course will introduce participants to modern systems engineering practices through various principles and development methodologies. Participants will apply systems engineering tools to realistic problems, and learn to recognize the value and limitations of modeling and simulation. Through a hands-on environment, participants will become familiar with issues associated with the development of systems engineering. Instructors will teach the class how to critique and create systems engineering architectures. Students will analyze current trends and techniques used today in order to determine manufacturing, maintenance, and disposal effects have on cost and value. These techniques, among others taught in the class, are important in the systems engineering field and can be utilized immediately in the workforce. The course is taught by Tommer Ender and Carlee Bishop. Ender is a senior research engineer in the Electronic Systems Laboratory at the Georgia Tech Research Institute. He also serves as head of the systems engineering applications branch. Bishop has over 27 years of professional military and defense-related leadership and management experience that includes directing studies and analysis efforts for HQ European Command, managing formal C-141 flight training programs, directing and instructing college-level programs in engineering, and managing major Department of Defense Projects. Government officials, government contractors, project directors, project advisers, engineering managers, systems engineers, software system engineers, and design engineers are encouraged to enroll. The course is also part of the Systems Engineering Certificate program offered by Georgia Tech Professional Education. Georgia Tech Professional Education is an academic division of the Georgia Institute of Technology, which consistently ranks as one of the nation’s top 10 public universities by U.S. News & World Report. Professional Education offers professional master's programs, short courses, and certificate programs to meet the needs of working professionals and industry partners. Programs are available worldwide through a variety of face-to-face, blended learning, and online formats. In addition to professional course offerings, the division administers K-12 outreach and English as a Second Language programs, and manages meeting and event facilities. On an annual basis, Professional Education enrolls more than 30,000 students and works with 3,500 companies. It is located at the Georgia Tech Global Learning Center in Atlanta and at the Georgia Tech-Savannah campus.